When you’re a regular guy you dream of someday owning a Ferrari or a private jet. 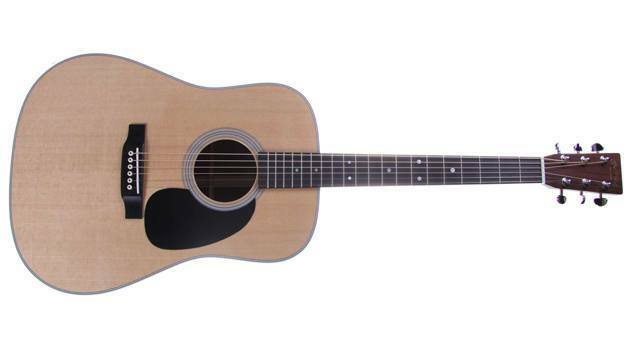 But when you’re a guitar player you dream of someday owning a Martin Guitar. And why wouldn’t you? Founded in 1833 by Christian Frederick Martin, the C.F Martin & Company has been producing guitars that transcend the realm of mere musical instruments, and is essentially the industry standard against which every acoustic guitar is judged. When you play a Martin Guitar you’re not just playing any old musical instrument. You’re playing a piece of American musical history. And no other guitar has as rich a heritage as the D28 . First introduced in 1931 by Martin, this iconic dreadnought first found acceptance in the country string bands which fell in love with its boomy sound. Since then it has found its way into the hands and recordings of America’s most celebrated musicians. Everyone from Bob Dylan to Elvis to Hank Williams, Joni Mitchell, Neil Young and Johnny Cash has at some point strummed a D28. And although the guitar might have gone through numerous design and build changes, it has always retained its quintessential feel and sound. The Martin D28 might not be the flashiest looking guitar around, but when you pick this you immediately get an undeniable sense that you’re holding something special. And to be honest, there’s something romantic about the quiet elegance of the instrument. Out of the box the guitar’s Sitka Spruce top is a creamy, yellowish white; which will age into classic, rich amber over time. The guitar’s sides and back are both solid Indian Rosewood and the back’s bookmatching is divided by a finely crafted inlay. Now Martin’s spec sheet for the D28 refers to the neck material as “select hardwood” but it almost certainly looks and feels like mahogany to the touch. And although the action on the D28 is set fairly high, the satin finished neck feels like it belongs in your hand. When you strum a Martin D28 for the first time, it feels like you’re playing back memories of every classic recording that you’ve ever heard over the past half a century. That’s just how identifiable and iconic the D28’s tone is. They say that when the Martin D28 was first manufactured, the country string bands that took to it loved it for its boomy low end that cut through the banjos and fiddles that it played alongside. And to this day, the depth and richness of a D28’s low end is truly something incredible to hear. But this isn’t just a guitar with great bass response and projection. The D28’s high quality tonewoods add a strong but sweet mid range to the guitar’s sound and helps sustain its tone for ages. And like with most high quality, solid wood guitars, the D28’s tone will only grow richer over time. There’s a reason why the D28 was the preferred touring companion of performers like Bob Dylan and Johnny Cash. And that’s because this guitar is truly built to last. From the bindings to the back braces to the tuning pegs, the materials used on this guitar are of the highest quality and so is the workmanship. So the chances are that any D28 that you buy will last you for at least a couple of generations. Aside from its gorgeous tone and incredible build quality, the next most amazing thing about the Martin D28 is its price tag. Currently the guitar retails at around the $2500 mark, which in all honesty isn’t all that high of a price for a piece of music history.